Celebrity Infinity has a manageable number of specialty restaurants -- three as opposed to six on many of the line's other ships -- meaning you can splurge for a night out if you want without being overwhelmed. We found a lot of choice in the included dining, although not necessarily at top standards. Many passengers on our cruise partook in Celebrity's drink packages, but we never noticed the drinking getting out of hand (perhaps because many got the package free in a booking promotion and had no incentive to get their money's worth). You can choose Premium or Classic beverage, wine, soda and bottled water packages and purchase them pre-cruise or onboard. There are two options for dinner in the Trellis Restaurant. Passengers can go with traditional, set seating (at 6 p.m. and 8:30 p.m.) or opt for the more flexible Celebrity Select Dining option. With Celebrity Select Dining, passengers have the option to dine any time between 5:45 p.m. and 9:30 p.m. and to decide whether they want to eat with their own party or at a mixed table with other cruisers. They can also make specific dinner reservations for each day of their cruise online in advance, make reservations onboard or simply show up when ready to eat. Cuisine at the Trellis is generally well received; the menu features a mix of traditional and imaginative fare with vegetarian, gluten-free, dairy-free, no-sugar-added and SPE items (healthy yet tasty, as validated by SPE-Certified consultants) noted on the menu. Anytime menu items include escargot and shrimp cocktail starters, French onion soup and Caesar salad; broiled salmon and New York sirloin entrees; sides of roast potatoes and steamed vegetables; and chocolate cake, apple pie and cheesecake for dessert. Service seems to be bit harried, particularly during peak dining times. Oceanview Cafe (Deck 10): The Oceanview Cafe is the ship's buffet restaurant, located aft on the pool deck. Coffee, tea and juices are available 24/7, and food is served from 6:30 a.m. to 1 a.m. The buffet is set up in one long U, but three stations are hidden way at the back, separate from the main buffet and easy to miss, which is unfortunate; these sections have different offerings from the regular buffet. Breakfast, served from 7 to 10 a.m. (with early and late options on each side), features made-to-order omelets, American and English hot breakfasts, fruit, yogurt, bread, cheese and cereal, as well as stations for Asian specialties, a poached egg bar and a waffle/pancake station in the back. The main lunch service runs from noon to 2:30 p.m., with half the stations remaining open well into the afternoon and evening. You'll find hot fare, a salad bar, a pasta bar and a carving station, with pizza, Asian and panini/fish and chips in the back. Tea sandwiches and scones are served from 4 to 5 p.m.
Dinner, 6 to 9:30 p.m., offers more hot fare and a carving station, plus a curry station and more pasta, pizza and salad. Don't miss Celebrity's homemade ice cream near the entrance to the Oceanview Cafe; it's available until 10 p.m. and quite tasty. Pool Grill (Deck 10): The Pool Grill, just forward of the buffet, offers hamburgers, hot dogs and veggie burgers with fries from noon to 6 p.m.
AquaSpa Cafe (Deck 10): In the Solarium, the AquaSpa Cafe is a small buffet, serving light meals by the thalassotherapy pool. Breakfast (7 to 10 a.m.) includes healthy muffins, fruit and oatmeal for free and smoothies, fresh juices and yogurt parfaits for an extra fee. Lunch, from noon to 2 p.m., centers on veggies and salads. 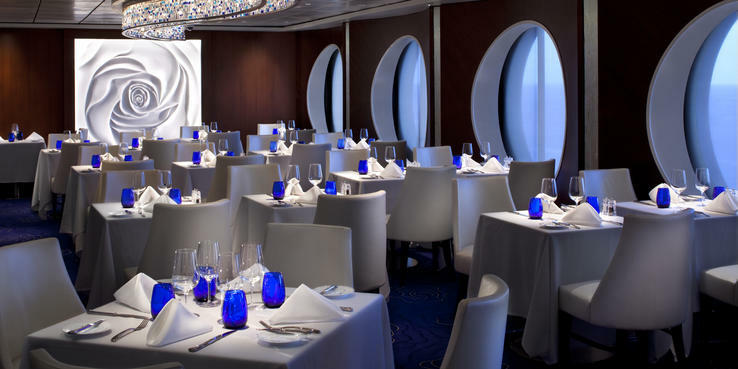 Blu (Deck 5): Celebrity's spa dining venue is exclusively for AquaClass passengers. The restaurant is open for breakfast (7:30 to 9 a.m.), serving light meals like smoothies and muesli. Dinner (6 to 9:30 p.m.) offers a changing menu of clean and simple cuisine, such as a roasted chicken breast or blackened ahi tuna. The venue is gorgeous, done in white with bright blue accents and a row of large porthole windows along one side. Note that Blu is intended to be AquaClass passengers' main dining venue for breakfast and dinner (though they can opt for Select Dining whenever they wish), and no other passengers are allowed. Luminae (Deck 4): Reserved exclusively for suite passengers, Luminae is a calm refuge with a grown-up culinary atmosphere. It's open for breakfast, lunch and dinner. The service is notably better here, as is the food. Expect sophisticated meals such as artichoke soup and veal chops. The same rules apply here as for Blu -- if you're traveling with a group and some of them are not booked in suite class, they will not be able to eat with you. Room Service: Room service is available 24/7. Breakfast door cards allow you to check off both cold (cereal, fruit) and hot (eggs, pancakes) choices and choose a window for delivery times. Throughout the day, passengers can order from a menu of soups, salads, burgers and sandwiches, pizza and dessert, with additional hot items like vegetable lasagna, New York strip steak and avocado-tomato quesadillas. Order via the phone or the interactive TV. Between 11 p.m. and 6 a.m., there's a $3.95 charge for passengers in interior, ocean-view and balcony staterooms. Tipping for room service is customary at other times. Tuscan Grille (Deck 5); $45 per person for dinner, $35 for lunch: Celebrity's signature Italian steakhouse, Tuscan Grille focuses on chops as well as Italian favorites. The antipasti course is gorgeous and easily splitable with a group. Dinner is served nightly, while lunch is served once per cruise (same menu). For an additional fee beyond the cover charge, diners can enjoy premium cuts of meat including an 18-oz. dry-aged New York strip or a 22-oz. dry-aged porterhouse. On sea days once per cruise, Tuscan Grille hosts the Crab Shack Lunch. For $40, you get two king crab legs, two crab cakes and crab bisque, as well as garlic bread and coleslaw. Sushi on Five (Deck 5); a la carte. Infinity's sushi restaurant is hidden in an easy-to-miss area behind the Cellar Masters bar on Deck 5. Sushi, sashimi and Japanese favorites like gyoza and edamame are on the menu here. Special multicourse omakase meals are available. There aren't a lot of seats -- there's no sit-down sushi "bar" -- and it can get crowded at dinner; reservations are recommended. Cafe al Bacio (Deck 5): This gorgeous cafe on the atrium serves free breakfast pastries and desserts from morning till night, but the specialty coffee and tea cost extra. (The general consensus is that the coffee here is the only coffee worth drinking onboard.) Across the atrium, the gelateria offers several flavors of gelato from 11 a.m. to 11 p.m., and it's definitely worth the extra fee. Le Petit Chef at Qsine (Deck 11), $55: Qsine on Celebrity Infinity features the Le Petit Chef experience, which incorporates 3D technology and digital animation into your meal. Essentially, a 2-inch-tall French chef projects onto your table and helps prepare your dinner in fun and eye-catching ways. The Qsine menu has two four-course choices, all with a French spin -- think bouillabaisse, roasted lobster and French onion soup.